This morning when I took my pup Max for his walk there was a definite hint of autumn in the air. I looked up into the trees .. and yes, there were even a few red and orange leaves. Where did summer go? Since it’s Foodie Friday on All The Single Girlfriends, I wondered how or if you transition your cooking and baking to reflect the seasons. Not counting the holidays like Thanksgiving or Christmas, Hanukkah or Kwanzaa where tradition has a huge impact .. but more quietly. Do your recipes include more root veggies than fruit? Are your meals hardier? If you live somewhere where the seasons don’t vary does the calendar influence your cooking style? Skipping around the Internet I found an app that can help transition your cooking from summer to winter. Yes, Gf there is an app for that .. Favorite Recipes by CulinartMedia. Brittany Irvin Blog has a detailed review. “This is a great application that allows the user to explore several different categories including: appetizers, coups, salads, seafood, chicken, beef, pork, lab, pasta, vegetarian, side dishes, and desserts.” It includes a shopping list and even how to videos. This foodie app does cost 99 cents. One of my fav foodie apps for recipes searches is the Conde Nast Epicurious app. This one also comes with a shopping list for each recipe. Sometimes when I’m shopping and need a little inspiration I’ll pull out my iPhone and “app it.” Good news is this app is free. Now it’s your turn! How do you transition your cooking from summer to fall? Do you use an app for that? 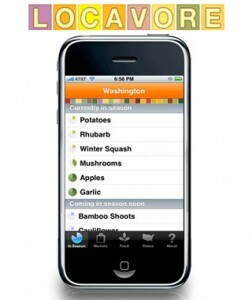 What’s your favorite foodie app?